The show building is absolutely ing massive. 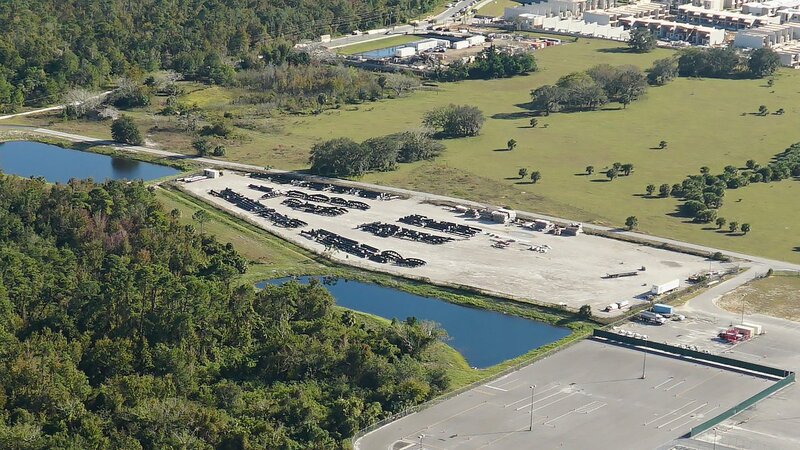 You can see it from basically everywhere in Orlando, it’s absolutely enormous. 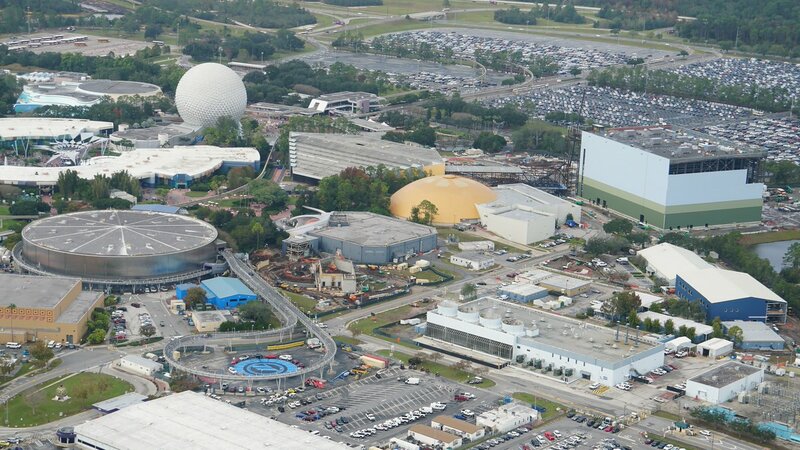 It’s far and away the biggest (looking) showbuilding at Disney it’s insane. Those pictures honestly still don’t do it justice. Yoris Kerkhoff, Matt N and vaugc002 like this. Which is why the fact that they're not going to theme it but just put light blue paneling around it is a horrible decision. Yoris Kerkhoff and Zek_Teh_Kek like this. 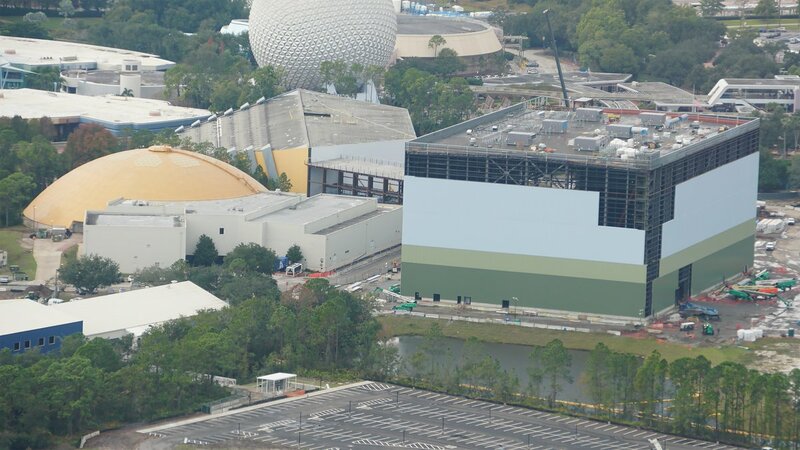 I'm hoping they'll at least plonk some trees between the building and the rest of Epcot? Yoris Kerkhoff and EpochEmu like this. Aerial view of Guardians of the Galaxy roller coaster track. In a backstage area reached from Sherberth Road. Jaiden M., Matt N and Pear like this. I really hope they at least stick some giant character cutouts or paint some murals on the walls. I know it's kind of away from everything else but it's still a highly visible building. It isn't QUITE a generic box but it's not too far off from that either. Having to check the expected delivery date about this coaster made me think that it could be an interesting info to have the year on each roller coaster construction thread title. It's Disney. Everything takes bloody forever so it's just expected now. Plus opening dates change and delays happen, I imagine it's probably just easier to leave it as it is. Yoris Kerkhoff and oriolat2 like this. It's extremely easy to edit thread titles. I do agree that it would be good info to have in the title although it might make the title line a bit too crowded. In the automotive industry, we always include the program's model year in everything we do. Most programs slip their timing a bit so instead of typing MY19, we just start typing MY20. Well I'm not specifically thinking about this coaster in particular but all of them I know opening dates change, but so does the name and even the manufacturer sometimes ! I just thought it would be convenient in order to follow up with the upcoming coasters schedule. It looks like it's been painted to be as anonymous as possible, to try and blend in with the trees and sky around it. That's great, but I don't think I've ever not noticed buildings like that. The mental link in my head is "this paint scheme gets used on warehouses in business parks." Yoris Kerkhoff, Serena and Hixee like this. Disney calls it Go Away Green, Blend Away Blue, and No See Um Gray. Matt N, sirloin, Lofty and 3 others like this. Show building? What show building? Every time I walk into Epcot, I always make note of that beautiful spot of perfectly normal sky to my left. Yoris Kerkhoff, Zek_Teh_Kek, Lofty and 1 other person like this. Yoris Kerkhoff, EpochEmu, CrashCoaster and 1 other person like this. I don't know about you, all I can see is a perfectly clear sky and some lush, green trees! Yoris Kerkhoff, Temleh and Pear like this. So I'm assuming the track inside the show building is already in place but it's hidden? Or are they feeding it in another way? I assume the former because the roof is down but I could be wrong. I have a feeling it's a bit of both, to be honest. The big stuff may already be in, but on the back half of the building (not shown in the Tweets above) you can see a much larger opening on the back of the building. Given that the side doors look to be standard HGV size roller shutter doors, this one on the back is much larger. Probably big enough to get a small-ish crane in, I'd have thought. I'd have thought the biggest factor would be how big the track pieces are, which is something they could presumably design for. Yoris Kerkhoff, Matt N and Ethan like this. As far as I'm aware, nothing or very little has actually been built inside the show building - they essentially just built the building and the ride should rise next.